It opens the door to exciting new opportunities. 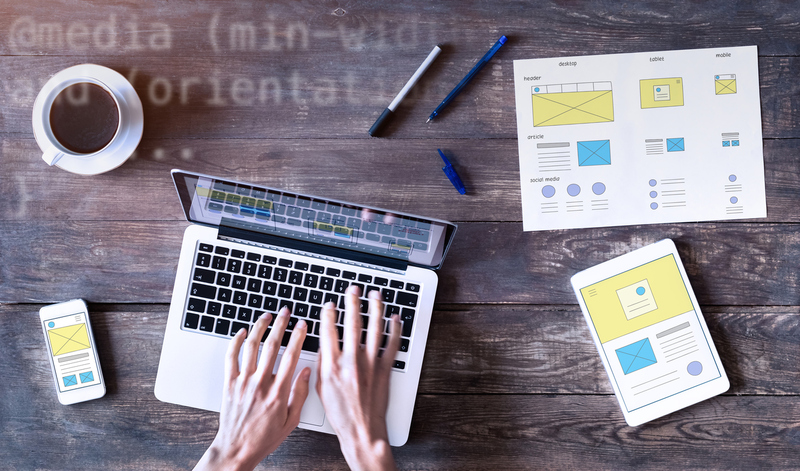 Of course, why a website isn’t driving traffic can stem from a plethora of reasons—that can only be fully addressed and explored by a thorough website audit, and of course, a little TLC. As a continued series over three blogs, we will provide strategic key tactics that companies can adopt into their website strategy to go from “why we aren’t” to “how we can”. If you’re not familiar with paid search advertising—we can start from the beginning. You’re at your computer, and you decide to “search” for something on Google. Google responds with a list of web pages that are relevant to your search. That list includes web pages that the Google algorithm determined were the best match for what you searched. This wasn’t because Google was feeling choosey this day—it’s partially because of Pay-Per-Click (PPC) ads. PPC ads are the web page names that appear at the top and bottom of that list provided by Google (also known as SERP). Though PPC ads will look similar to the organic listings, their aesthetic distinguishes them as an actual ad. You can increase your visibility on search engines (like Google) that will increase your website traffic (and hopefully revenue). Want to learn more about PPC ads? Check out our past blog on the topic! To clarify, we actually meant to say “GREAT” content. Top-notch, interesting and creative content is what is going to drive your website presence—not only that, it will engage your target audience with your brand and inspire them to take action, whether that be sharing your content, signing-up to receive your updates, etc. Now, what is GREAT content? That’s a great question (see what we did there?). Of course, today’s content trends would suggest investing in various forms of creative content including digital, infographics, videos, blogs, etc. We are constantly challenging our clients to think big when it comes to content—how ARE we different in our industry and how CAN we be different with our content? 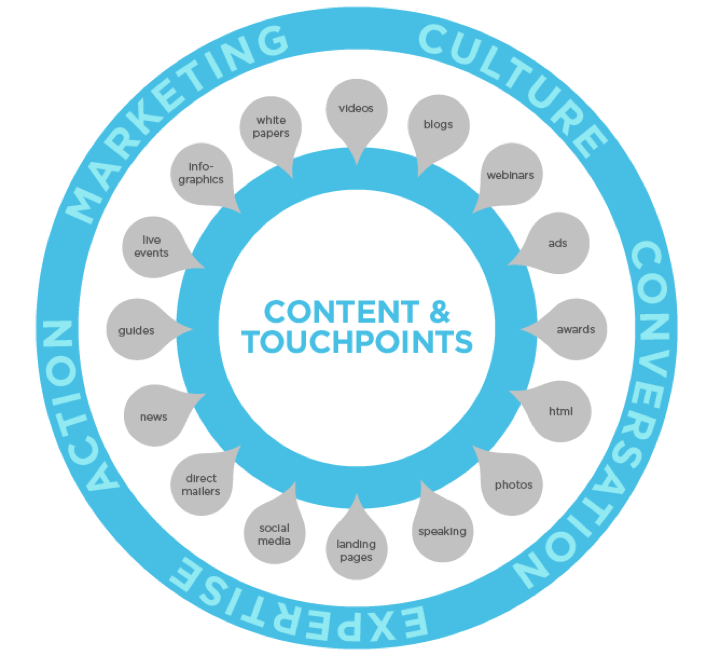 Our handy touch point wheel here gives you an idea of ALL the different types of content and how they help MARKET your company, stimulate CONVERSATION, showcase CULTURE, tout EXPERTISE, and inspire ACTION. Email marketing is not only a great way to drive traffic to your website or blog, it’s also a great way to strategically build out a list of your current clientele, partners and prospects and utilize that list as a strategic sales tool, while also nurturing your company relationships and keeping them engaged with your brand in some way. It’s effective because email is the third most influential source of information for B2B audiences and 86 percent of professionals prefer to use email when communicate for business purposes, reports WordStream. Likewise, 80% of retail professionals (B2C), indicate that email marketing is their greatest driver of customer retention. We live in a time where no one can deny the power and reach of social media. However, it’s easy for businesses to get overwhelmed and either 1) retreat from social media practices and trends or 2) create an account on every existing social media platform. As a strategic partner for our clients, we often remind them that different social media platforms exist for different purposes, and also different audiences—and therefore, not every social media platform will be a fit for your business objectives. Social media is certainly worth your time and budget, but the correct research must be conducted to determine where you should gauge your efforts. This tactic is fun, because it can be a combination of tactics #1, #2 AND #4. The corporate world has caught onto the fact that social media plays a huge role in modern-day advertising. Social media advertising is a great way to reach your audience in a highly-targeted way and inspire them to take the next step—as long as your message is enticing enough. If you know your website isn’t performing, or are curious how it could be better—Philosophy is well equipped with strategic website and digital experience to offer that guidance! To continue learning, watch-out for Part 2 of this blog series.